When I received the message from Costa Panzatis about his new project and started my usual research on the deck and its creator, I discovered not only stunning designs but also an interesting human being behind all this, so I had no choice but to start writing about the campaign. Costa combines the madness and talent from music, art, poetry and comedy with a passion for card collecting. 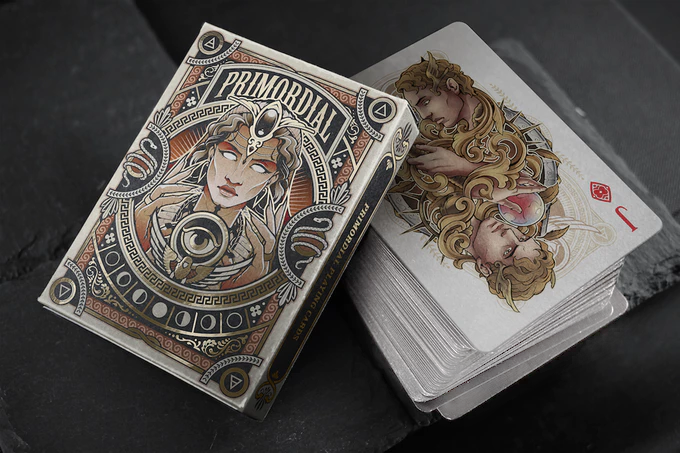 This way, he decided to team up with a luxury illustrator, Charles Adi (Blackout Brother) and create his first production: PRIMORDIAL GREEK MYTHOLOGY. 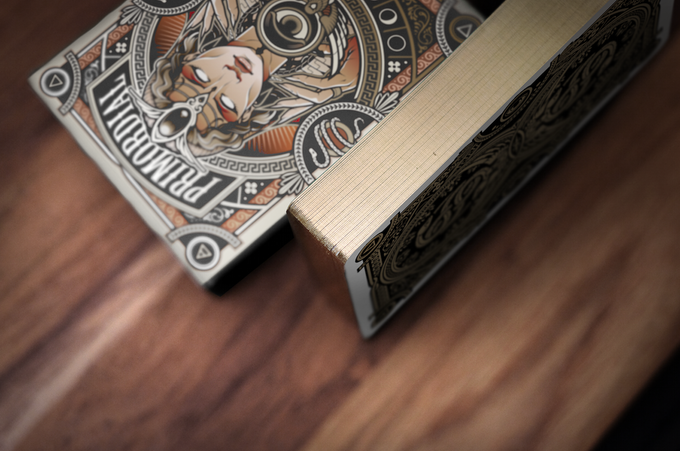 The inspiration of the deck comes from the Theogony, the poetic work of Hesiod, considered the first Greek philosopher. In his work the author describes the genealogy of the Greek mythology’s gods synthesizing the different beliefs about the origin of the universe. 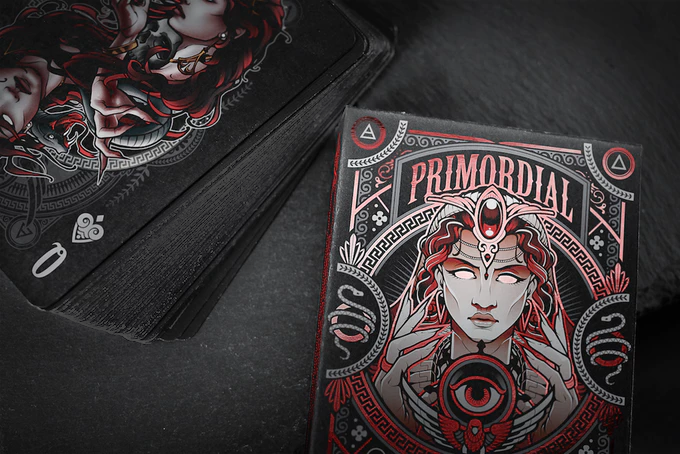 Thus, the primordial deities are defined as those that existed in the beginning of the world and that arise from chaos to give sense to everything. On this exciting inspiration, the artist has created a beautiful selection of portraits of great aesthetic strength with asymmetric compositions of the different deities. 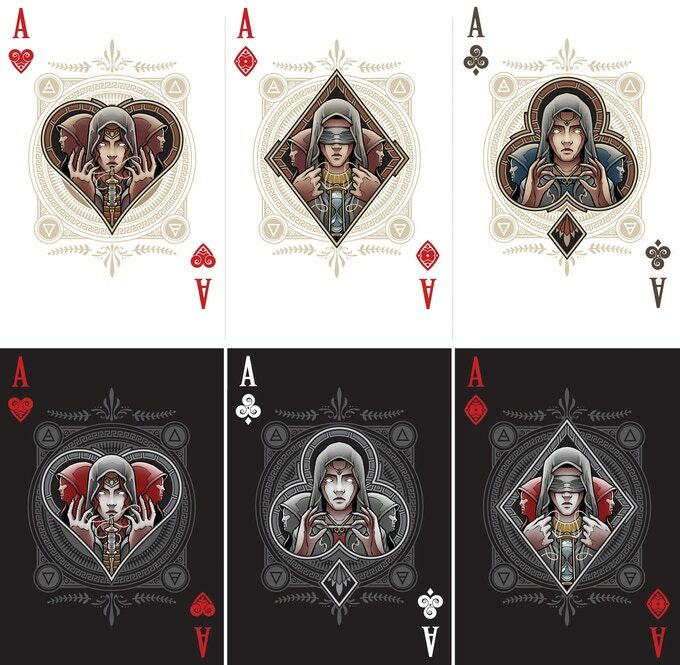 Ornamental elements reinforce the story behind each of them and produce detailed cards with a special personality. 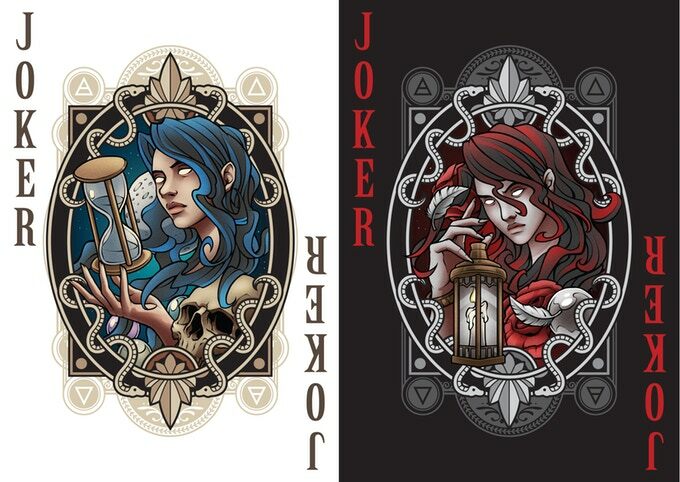 The aces are represented by the Moirai or goddesses of destiny and the jokers by Tekmor, the primal goddess. The back depicts an intricate symmetrical composition of the ancient symbol, attributed to Orpheus, with the serpent wound around an egg. 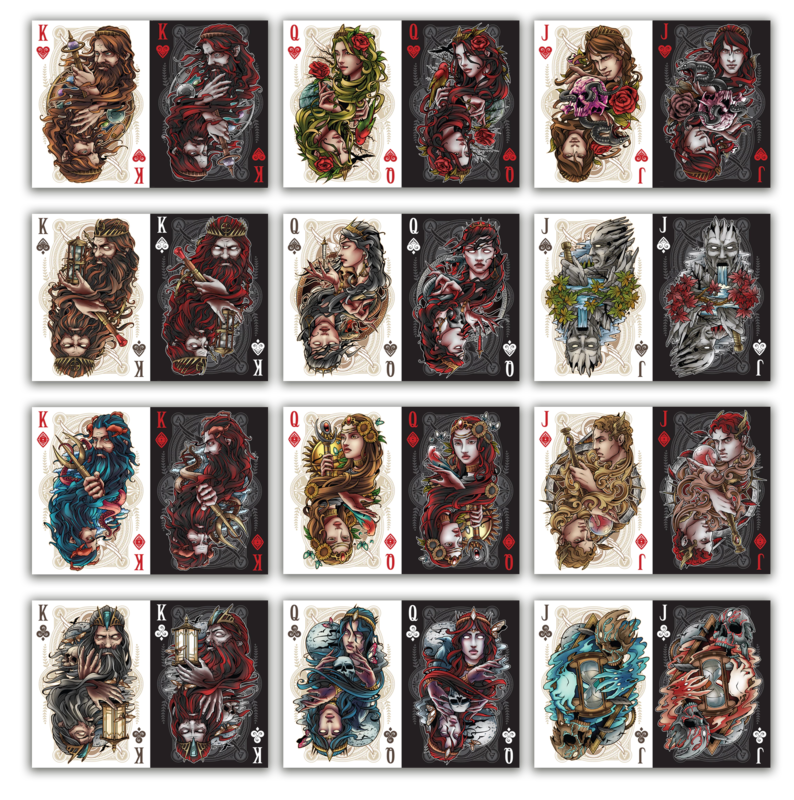 THREE different editions of the deck have been created for the campaign. 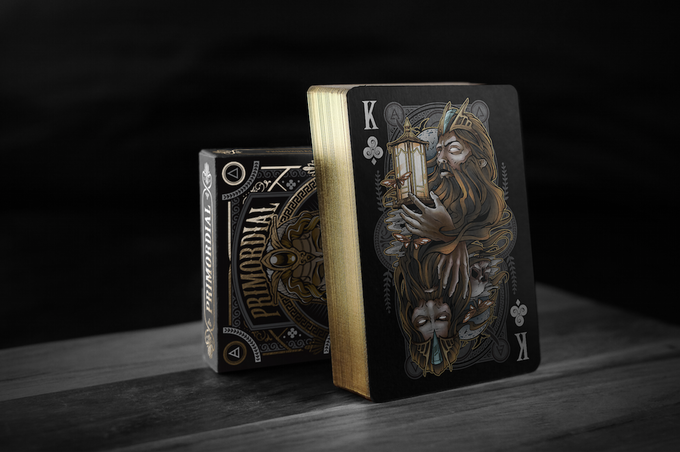 Although it can be considered the standard deck, it is a true display of luxury. 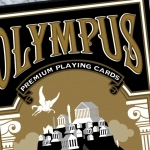 Illustrations with white backgrounds and a back with metallic inks will be depicted on cards printed by the USPCC inside a tuck case with inner printing, foil and embossing, as well as a numbered seal for a limited print run of 1500 decks. 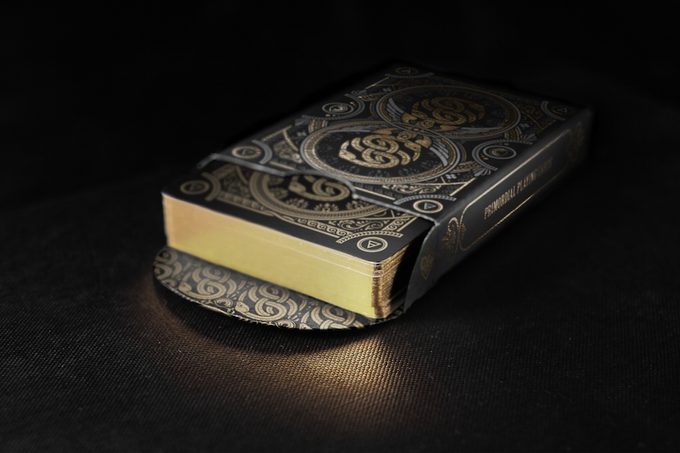 In addition, there will be a Limited Gold edition of 500 gilded Aether decks with a numbered seal. 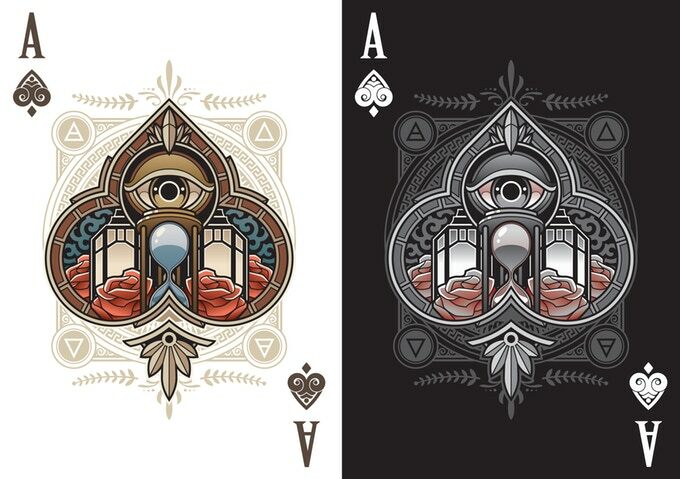 It is the dark version of Aether, with gray backgrounds and a much more sober color scheme. 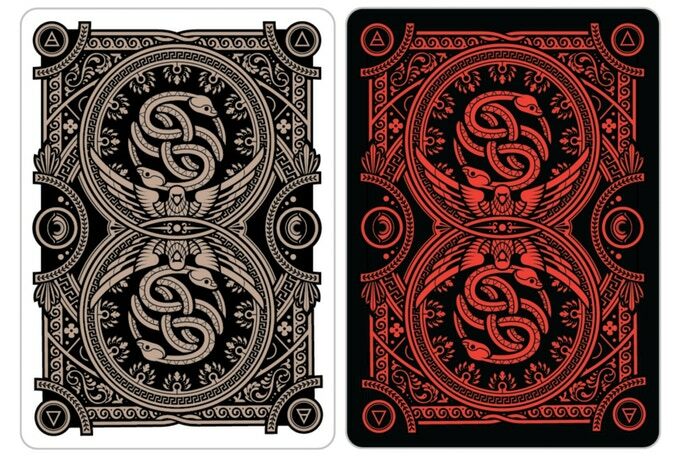 The edition will also use red metallic inks on the back and a tuck case with all the extras (foil, embossing and numbered seal) with a print run of 1500 decks. 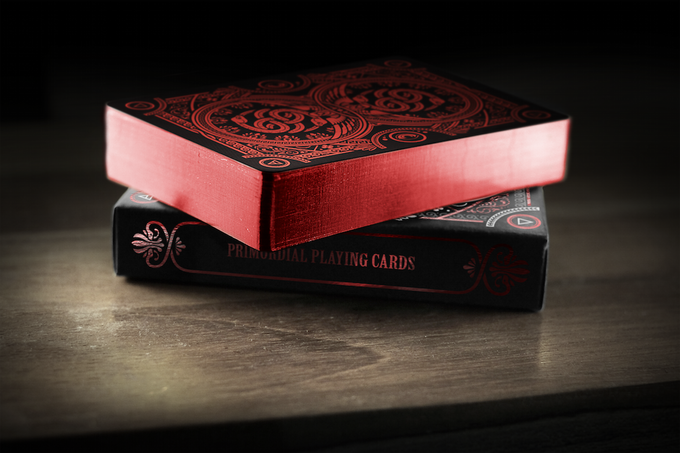 A red red gilded Ruby Edition of 500 decks will also be made with a numbered seal. This will be the most exclusive of all. 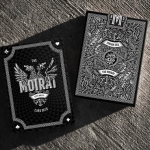 With an ultra-limited print run of just 200 gilded decks, it will be printed by Make Playing Cards with an embossed and foiled tuck case, numbered seals and a special laser engraved Carat case. Without a doubt a stunning collector item. 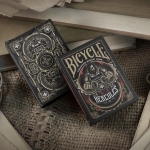 In addition to the decks, the campaign offers several add-ons such as cases, dice, coins, key rings, metal letters and prints. 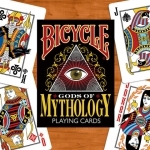 This is, without a doubt, one of the most ambitious and varied campaigns of the year and it will delight the fans of playing cards, history and mythology.